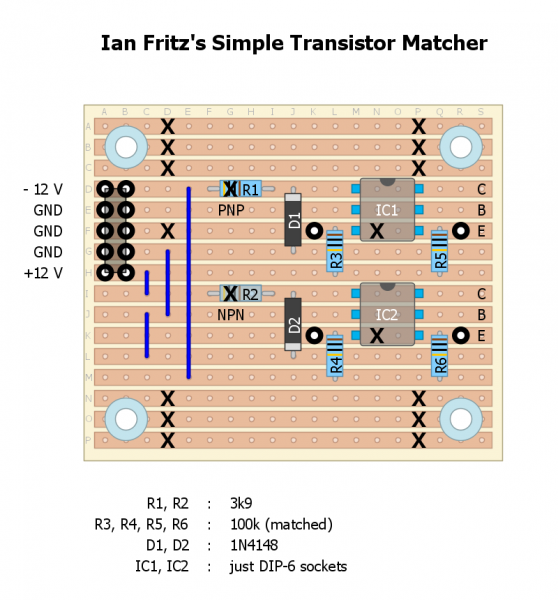 Im trying to match trannies following the attached Ian Fritzs circuit, but I get nonsense readings. Like 1.4V and going up throught until 1.6V. The readings keep rising over the minuts and never stops. I understand it should be reading around 0.6/0.7V correct? But I dont have the zener. Could it work without it?. What´s the zener function here?. I can use a regulated power supply to put exactly some random voltage to the circuit, so if it needs 5.1V I can supply exactly this. 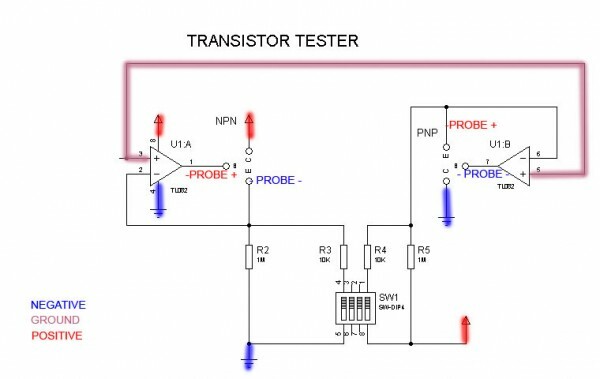 Where should I put the probes in the opamps circuit? Im a bit lost. Thanks! MAybe Ian Fritz can tell you more, guess he's sometimes still visiting here and can expalin again or say what i/we did wrong, then hopefully getting it then. You really need the zener diode as it makes the reference voltage needed for the measurement. And also do use a 5v1 one, as around that zener voltage the zener's temperature dependency is as small as possible. Knowing who Ian Fritz is, I'd say that there are no components in this circuit that can be casually eliminated including the zener diode. I ordered an DSO150 osci, but it was DOA. I´ll be getting one in other moment, thought. I´ll check the matcher. Thanks! @bluehell. I´ll search for the zener. Thanks for the explanation! I wonder how much influence a mismatch in the Zeners would have on the measurements… At least i'm unaware if there is some difference of a few mV in the Zeners and if it's too marginal to care of. Well my guess is that it is not much or has effectively no effect on the measurements, but i'm not Pretty sure. For clarity -- that schematic shown on this thread is misleading as hell. When matching transistors, do it while watching a mildly boring movie. Leave five minutes after you've placed a transistor to measure it. Also, leave your reference transistor in there permanently. All your measurements will be with that one as a reference. don't you have to switch the trannies in their sockets to get the difference in your measurements??? means trannie which was sticked into socket a must be sticked then into socket b and the other trannie vice versa? 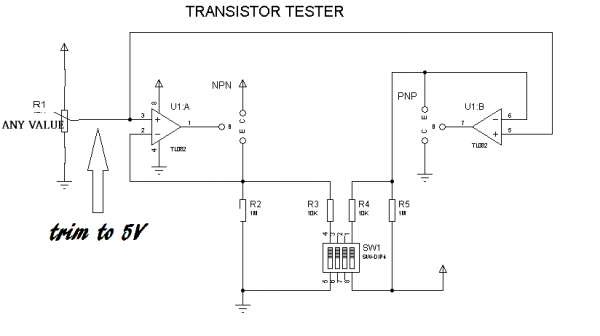 due to the nature of that we don't have an ideal=equal reference voltage at both trannies? So you have to substract delta UBE 1 from delta UBE2 to get the mismatch of the trannies? Naw, leave Q2 permanently stuck. Just endlessly replace Q1 and measure. Ok, while breadboarding I have realised that this tester is for single +- supply. I have modified it for + ground - supply, so the zener is not needed. I have also added where the probes goes for newbies clarification. Now it reads perfectly.